Looking For A Yoast SEO Alternative? Rank Math SEO plugin for WordPress is hands down the best alternative to Yoast SEO WordPress plugin. And the best thing is, Rank Math is completely FREE! We have put special care into making Rank Math one of the fastest SEO plugins there is - even with such a massive list of features it comes with. Yoast SEO plugin's code is almost 1.5x larger than ours. It adds more requests & bulk to your website as a result. Our code is precise and effecient. That means, fewer PHP requests, more speed, many extra useful features. This plugin is very promising. You have all SEO tweaks in one place and all this for free. I recommend it. Are you already using Yoast and looking for an alternative to upgrade to? We have a neat import tool to transfer all your information, including post meta and settings from Yoast into Rank Math. It is the most detailed, advanced SEO plugin that is also friendly to use for everyone using WordPress. If you want to really boost your SEO, go Rank Math! See how Rank Math SEO stacks up against Yoast SEO. We are the only all-inclusive SEO plugin available right now making us the most logical Yoast alternative. It's super easy to migrate from other SEO plugins. There are many FREE features in this plugin that are paid premium features in other plugins. Check out the working demo and test drive Rank Math SEO plugin to experience its features first hand. 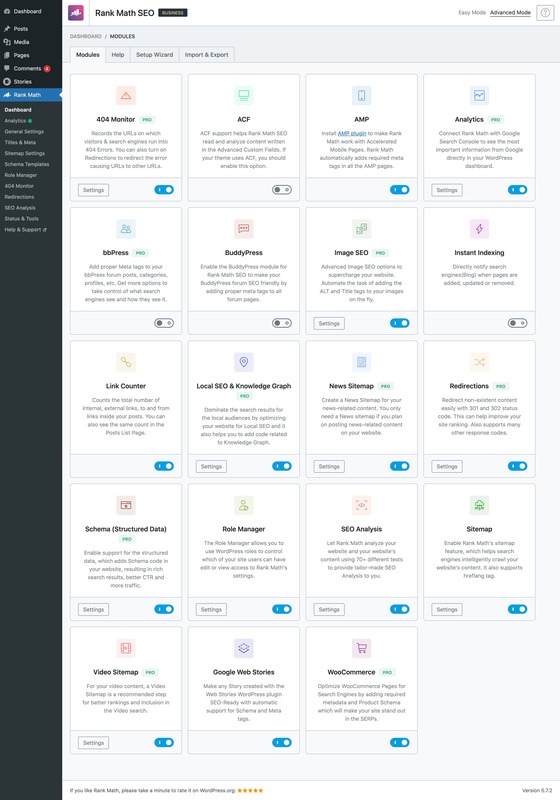 If you have already done that and want to have a glance at all the features of Rank Math, check out the screenshots of Rank Math’s backend below. 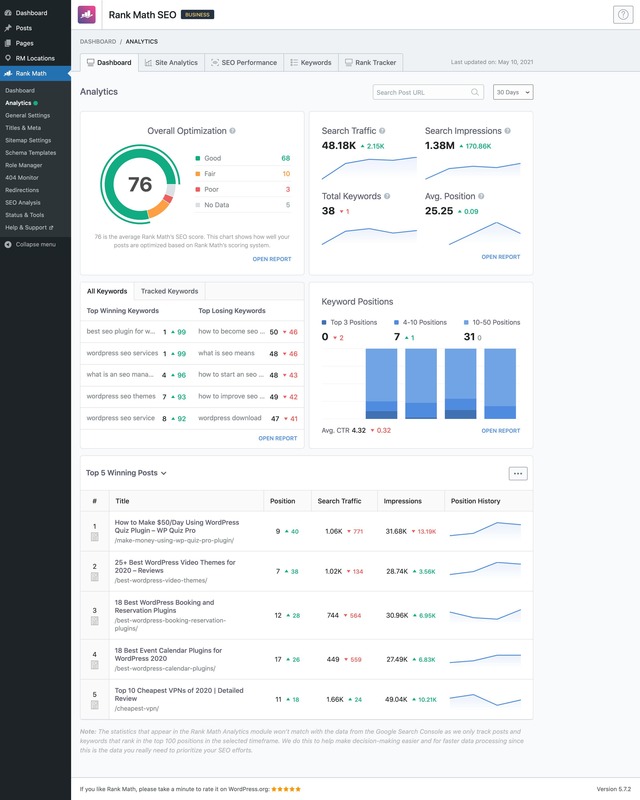 Even if you haven’t checked out the demo, these screenshots will help you understand the powerful features and user-friendly interface of Rank Math quickly. Rank Math is a Game-Changer! Get answers to all your technical questions in the comprehensive documentation. Don't just take our word for it. Ask our lovely users! Very simple to configure and use, but also very useful to guide in optimizing posts & pages according to the best SEO rules. It starts a new generation of SEO Plugin! Rank Math is Awesome. I don’t know how it happened, my traffic increased by 40%. Just within 24 hours of installing Rank Math. I am not even done with the configuration. This is the most useful and best SEO plugin of all time. I don’t know why people are still wasting money on premium plugins like Yoast or any other. The plugin is really a Swiss Army Knife for us analysts, this is because within a single tool we have everything I need to if you do a high-level SEO analysis. I didn’t think this could be much better than the established plugins in the market. I was completely wrong. RankMath is the future of SEO plugins. Rank Math SEO is easy to use and easy to navigate. We have simplified the options and guide you about optimal settings every step of the way. Should you need any assistance with the plugin - use our 24x7 support system to get help any time you need. You have some questions? We have got the answers. Go through the below FAQs to clear your confusions about the Rank Math SEO plugin. Can I use Rank Math on more than one website? You can use the Free version on any number of websites. Yes. All the current features are provided for free as of now. Can I try Rank Math before purchasing? Absolutely. 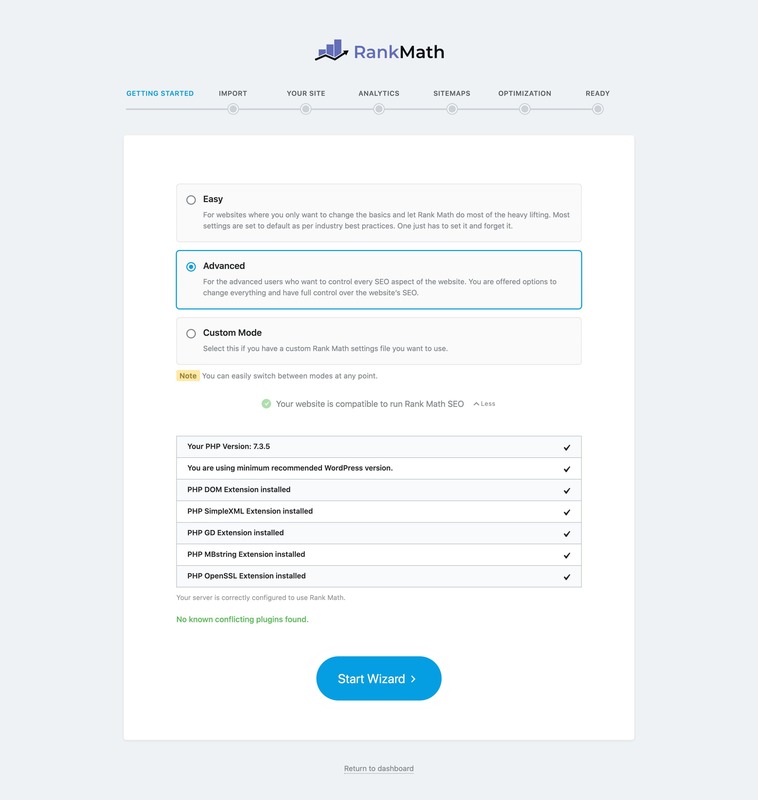 You can download the free version of Rank Math and install it on your website to experience all the features first hand. How do I download Rank Math? Click the link for the free version, create a Rank Math account or log into one, and you’ll be presented with the download button. Can I customize Rank Math? Yes. Rank Math is designed to be a flexible SEO plugin which offers a variety of ways for you to configure your website's SEO. Using these options, you can customize Rank Math to your liking. To see more details on the options, you can test the free version of Rank Math or read about the features in Rank Math's knowledge base. What themes is Rank Math supported with? 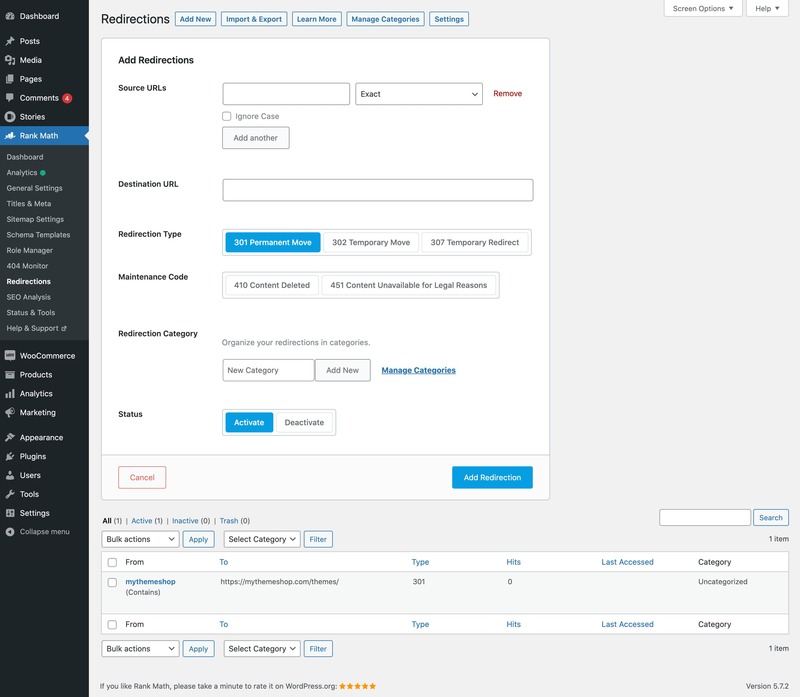 Rank Math has been tested with and supports all major WordPress themes. Since we follow WordPress' plugin development guidelines, you can rest assured that Rank Math will work perfectly, no matter what theme you use. If you've installed Rank Math and are facing issues, it might not be because of a theme incompatibility. Please get in touch with the support team by sending an email to support@rankmath.com and the support team will look into it. Rank Math has been designed using WordPress' strict plugin development guidelines and therefore, is compatible with all plugins. However, if you use another SEO plugin that performs any of the functions that Rank Math does, then you might get unexpected results. We recommend that you disable or delete other SEO plugins for the best results. To use the free version of Rank Math, there is no need for a license key. No. Rank Math's code has been created and optimized for maximum performance. That is why using Rank Math on your website will not slow down your website. On the contrary, there is a good chance that your website will perform better than ever with Rank Math, as it does the job of multiple plugins. Once you remove the unnecessary plugins from your website, your website's performance is sure to get better. That is preferred. Rank Math is designed to be an all in on SEO plugin that cares of everything SEO related. If you use other SEO plugins with Rank Math on your website, not only will the performance of your website be negatively affected, but both plugins working together can produce unexpected SEO results. You can, but we don't recommend it. Rank Math has all the functionalities that you would need in an SEO plugin. If you still prefer to use another plugin for a specific feature, you can do that. But, we would recommend that you turn off that functionality from Rank Math to avoid potential issues. Can I transfer my SEO settings from another plugin to Rank Math? Absolutely. 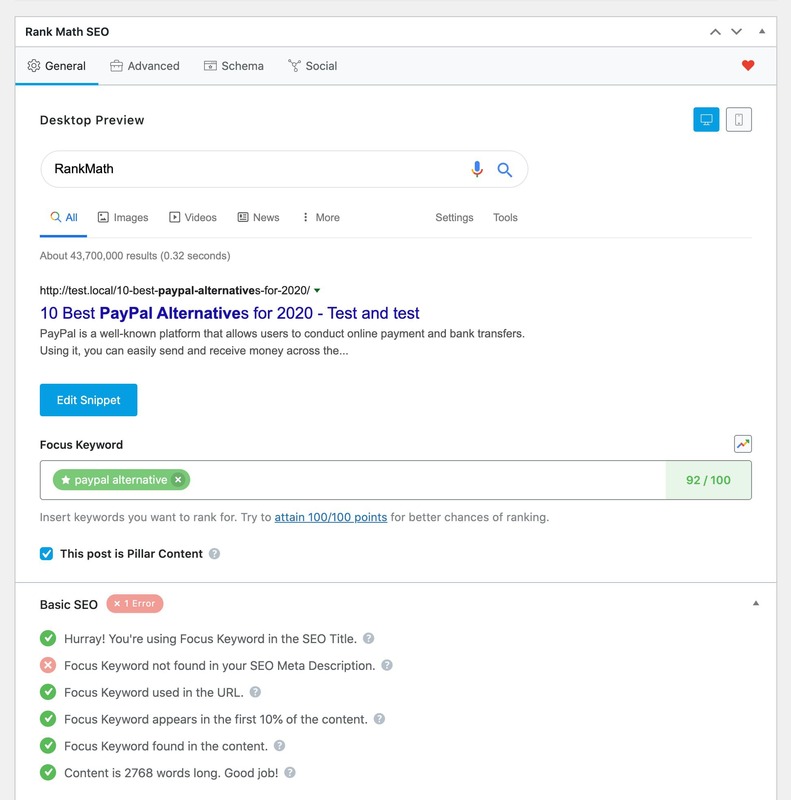 Rank Math has a built-in feature to import SEO settings from the most popular SEO plugins like Yoast SEO, AIO SEO pack and more. 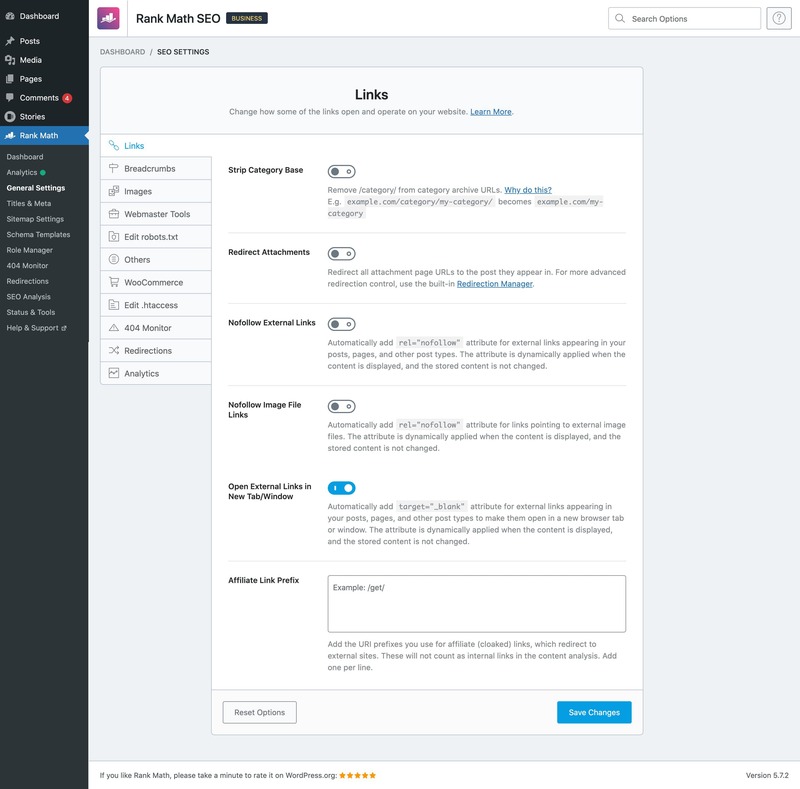 Once you install Rank Math and run the setup wizard, you'll see a dedicated step where you'll get to import all your SEO settings to Rank Math. No, you won't. 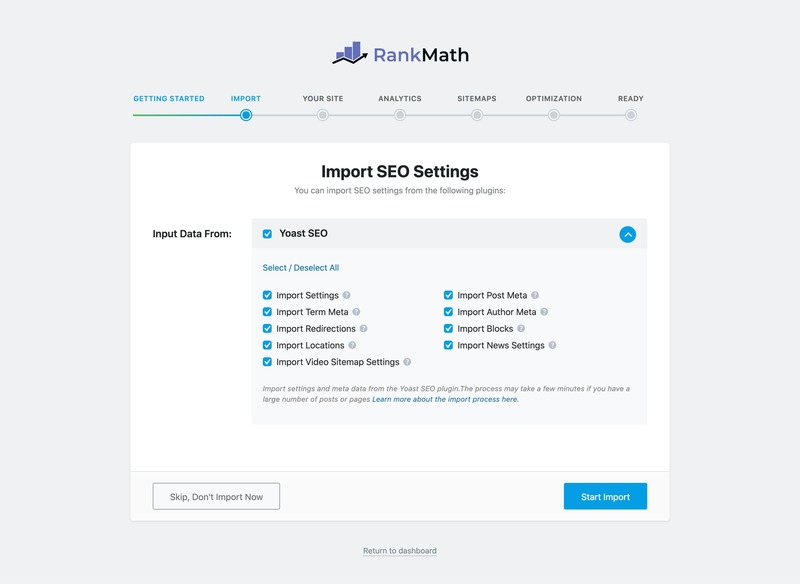 When you install Rank Math, it will seamlessly import your settings from your current SEO plugin. Once the process is complete, the search engines won't even notice a change on your website. If you setup Rank Math from scratch, then your search engine rankings will depend on how you configure it. We have a detailed guide on how to setup the WordPress SEO properly. Rank Math is created to supports most technical configurations. A simple guideline is that if you’re able to use the latest version of WordPress, you’ll be able to use Rank Math. When you initiate Rank Math’s setup process, Rank Math will also perform a compatibility check to confirm if your server can run Rank Math. Though the plugin requires atleast PHP 5.6 You can ask your hosting to upgrade your PHP. You should use PHP 7 and above for best performance and patibility. Yes, you need to have the Business plan opted on WordPress.com. Rank Math fully supports self-hosted WordPress websites. Will I get support for the free version of Rank Math? Definitely. You will receive support through our support plan exclusively for our free products. The support plan is very affordable (just $9 per year), and it gives you access to support for all free MyThemeShop products for a full year. How quickly will I get an answer to my question? The MyThemeShop support team is available to support you 24x7x365 and replies to all support queries within 24-48 hours. However, most questions are answered sooner, and you can expect to get an answer within minutes. Can I use Rank Math on commercial projects? Yes, you can use the free version in any commercial project you seem fit. Do I have to pay every year to use Rank Math? No. The free version does not require any payment from you for using the plugin and its features. How do I update Rank Math? There are 2 ways to update Rank Math. First, you can download the latest version from your MyThemeShop account and upload it to your website. Second, you can install the MyThemeShop theme and plugin helper plugin, using which you will be able to update Rank Math in a single click. Although our team continually works on Rank Math, we don't follow a fixed schedule for updates. If a critical bug is found, we will release an update to fix it immediately. For new features, regular updates do happen, but not at a set time. 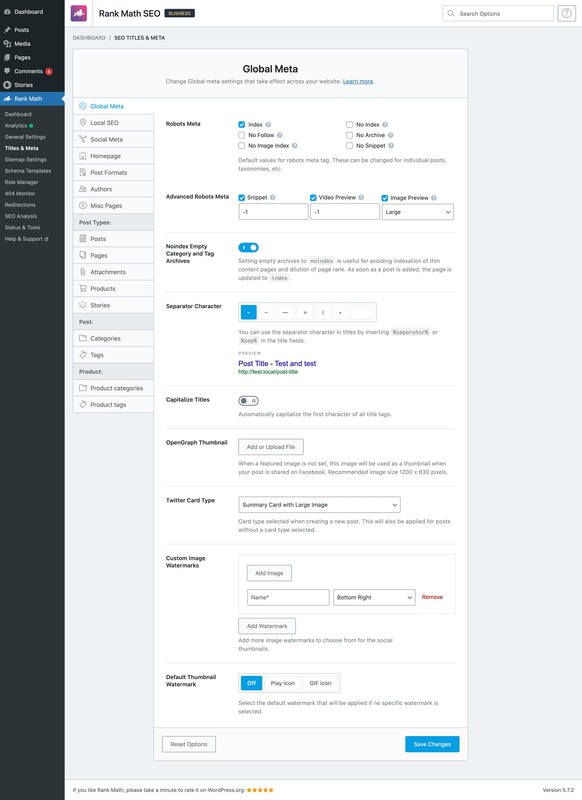 As soon as an updated is released, you will see it inside your WordPress admin. Currently, we support PayPal and credit cards for payments for all MyThemeShop products. Get Rank Math Plugin Today! With so many features and options, the real question is "why shouldn't you get the Rank Math SEO plugin?". You have nothing to lose and everything to gain. It is the logical upgrade you have been waiting for and the best Yoast alternative in the market right now.